The dramatic poster for Wayne McLoughlin’s long-awaited movie “Buck Fever” can be customized to include the names of your hunting party, family members, business associates, or dear friends who share your passion for the hunt! 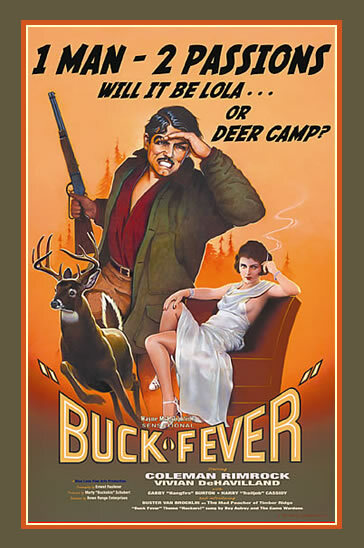 A truly memorable gift for the Father who introduced you to the great outdoors, a humorous gift for that husband of yours who starts airing his hunting gear in August, and a great commemorative bonus for those buddies who have to fix the 4 a.m. eggs because it’s your cabin, “Buck Fever” The Movie Poster provides the opportunity to immortalize them all! Once your names have been entered on the above form, press the “Order This Print” button. Before printing your unique poster, you will receive a faxed or e-mailed confirmation of the spellings you’ve submitted. E-mail or fax your approval, and your print will arrive in about three weeks. Allow extra time for framing. All names can be changed to your choice of family or friends’ names, company employees, etc. Please call if you have to discuss a larger custom size to accommodate more names: (603) 445-2409. Please call us at (603) 445-2409 if you need help with nicknames or have additional names you need incorporated. We’re happy to help! Lola: leave as is, or change to name of your “dream girl”: Sweetie, Babs, Charlotte, Collette, Dorothy, Carol, etc. Starring: choose two main stars -- yourself, Dad, hunting buddy, wife, son and daughter, friends. with: choose at least 2-3 friends incorporating a couple of nicknames. sung by: choose the best singing hunters in your camp!